My first deer, taken with my grandfather. 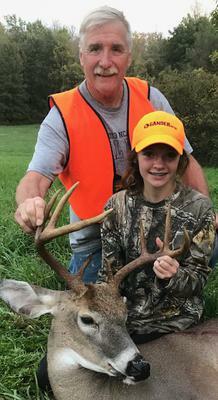 MaKenna Grant harvested this Genesee County 8-point using her 20 gauge for the 25 yard shot. She was hunting a small field edge with her grandfather as her mentor. The deer dressed out at 175 lbs. MaKenna’s twin sister was hunting the opposite end of the small field and showed great sportsmanship in helping her sister celebrate her success.